In2Connect sell the largest range of high quality female PCB card edge signal and power connectors for the PC, communications, instrumentation and test equipment sectors including 200/250 C “burn-in” applications and to UL/CSA listings if required. Small Minimum Order Quantities – 10 piece minimums in many cases. In2Connect sell the largest range of high quality female PCB card edge signal and power connectors for the PC, communications, instrumentation and test equipment sectors including UL/CSA listings where required. The contacts of our standard female edge card connectors are made of metals like Phosphor Bronze, Beryllium Copper, Beryllium Nickel or Spinodal and are plated with a thin, metallic coating that improves conductivity and prevents rust and corrosion. Plating materials include gold, copper, nickel, and silver. Contacts are housed in a body moulding made of a plastic material suited to the required operating temperature; these may include PBT, Valox*, Thermoplastic Polyester / PPS Ryton*, Polyphenylene Sulfide / PEEK, Polyetheretherketone / PA9T, High temperature polyamide. We offer a complete line of Sullins, Micro Plastics and EDAC female Edgecard Connectors ranging from .050″, .100″, .125″, .150″, .156″ and .200″ contact spacing with Wire Wrap, Dip Solder, Press-Fit, Right Angle and Extender Card termination styles. These connectors are available in a wide range of sizes from 4/6 to 100/200 positions depending on contact pitch and include a variety of mounting configurations. All parts are currently manufactured to be RoHS and REACH compliant. Meets MIL-STD-202, Method 108 (For high tin content solder in hi-temp solder applications contact sales!). 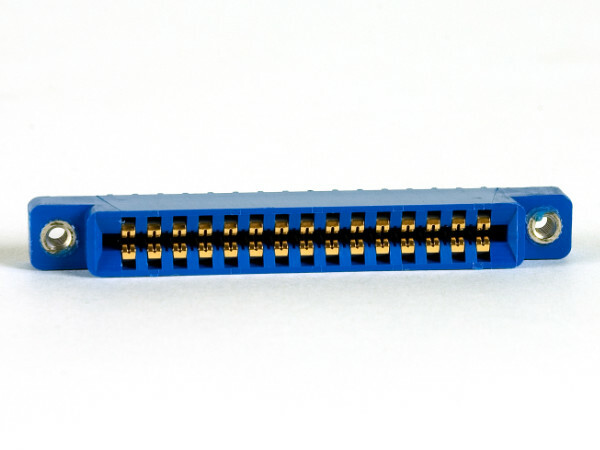 Female card edge connectors are used around the World in a wide array of consumer, industrial, and commercial applications. They are most frequently used in electronic component testing, communication equipment, medical equipment instrumentation, power converters and power supplies, along with aerospace and automotive systems and products.